Early in 2006, in response to Tate, Nina and Graham Williams agreed that they would permit replicas to be made of some Naum Gabo constructions. The topic had been discussed with Tate on several occasions before this and previously Nina Williams, the major copyright holder, had refused absolutely to allow replication. Nina and Graham Williams had discussed the topic for over twenty years, always in terms of securing Gabo’s work, never in terms of multiplying it and never for reasons of financial gain. The agreement was not without caveats, however, and in March 2006 Graham Williams wrote a document intended to lay out the considerations and conditions that applied to the agreement. That document follows unaltered.1 The copyright holders also produced another document – a licence to allow the work to continue. The latter remains under discussion and is not included here. At the time the document that follows was not considered to be a final word. It was a beginning and it was anticipated that it would be augmented in the light of experience as the project developed. The constructions of Naum Gabo, though made by hand, do not carry the individual marks of the artist on the surfaces as do the abraded stainless steel planes of a sculpture by David Smith, for instance. The materials remain as they were manufactured; the artist profiled, bent and fixed them together – they are constructed. This way of working produced sculptures that, it might be thought, could readily be copied by others. Some are made in materials that were thought by the artist to have a long life but have proved unstable to the point of self-destruction. The solution appears to be simple; a replacement can and should be made to allow the form and the idea to continue to live. As with so much in life the reality is not so simple. Gabo carved a number of stones and he cast a few bronze examples from some of them. The family have not cast any further examples and no permission would be given to cast a copy of any Gabo sculpture, whether or not Gabo had cast copies. This text is only concerned with those sculptures made by Gabo that are constructed. Gabo made a number of versions of many of his constructions, usually to explore the idea or the construction further but sometimes to meet demand. That is the privilege of the artist. He did not edition his sculptures, that is to say, make several identical and numbered examples of a work. His heirs have never made more of his works. They did cause a Catalogue Raisonné to be published in order to establish what Gabo had created. The oeuvre remains as it was on his death. In making a replica intended for display an object is brought into existence; it will look like a sculpture. Perhaps we know that it is not a real Gabo but not everyone would agree now, or in the future. Something made decades after the artist’s death may be close to his intention and way of working but it has not been accepted by him as his work. A distinction has to be made between Gabo’s original work and replicas made so that the form does not disappear altogether. The desire might be that the replica copies the original so closely it could hardly be detected as not by Gabo, and so it would be a sculpture as far as looking at it was concerned. Yet it must not attract the mantle of an original work, nor that value. Replicas might be made for many reasons, not all of them commendable and so some control over the making of copies is essential. That control is copyright. The copyright in the works of art and texts by Naum Gabo rests mainly with Nina Williams, the artist’s daughter, and to a lesser extent with her husband Graham Williams. This document sets out the circumstances in which the copyright holders will sanction the making of a replica of a sculpture by Naum Gabo. It will detail the information required before consent is granted and similarly the controls on the making of each projected replica, after consent has been granted, to the end that the replica or study model is forever identified as a copy and not an original work of art. It is not envisaged that fees or costs will be charged for giving consent but they may be charged in some circumstances. Some expenses may be charged by agreement. This will entirely depend on the particular project and should be established at the outset of each project. Tate – in particular, Jackie Heuman, Senior Sculpture Conservator, Derek Pullen, Head of Sculpture Conservation, Matthew Gale, Head of Displays, Tate Modern, along with other members of Tate staff – is working on a project to research all the issues involved in making a copy of a Gabo sculpture. The range of these considerations includes the evidence about the sculpture at various times since its creation, the techniques that might be employed to record a sculpture’s condition and to monitor its changing condition as well as the techniques and materials that were originally employed and which might be employed in making it. There are also art historical, aesthetic and other curatorial issues to be addressed. The project is at the stage of seeking funding support but to arrive at that point much research has already been undertaken and considerable consideration has been given. The experience and knowledge of Gabo’s work acquired by all those involved at Tate is a major factor in giving the copyright holders confidence to proceed with the idea of replicas of sculptures. At the present the copyright holders will only sanction the production of a replica of a Gabo sculpture if it is produced by the Tate Sculpture Conservation Department for Tate’s collection or other institutional collections. It should be noted that this does not preclude the production of a replica for museums other than Tate. Whilst copyright rests with Nina and Graham Williams it must also be recognised that ownership of Gabo’s works rests in large part elsewhere. The owners of any work considered for replication also have legal rights and the permission and participation of the owners will be necessary. Nina and Graham Williams continue to exercise the privilege of copyright in order to safeguard the work and reputation of Naum Gabo. Whilst the staff of Tate inspire great confidence in this respect the copyright holders must deal with many museums, galleries and some collectors around the world. In order that permission is granted for the replica to be made the copyright holders will require various steps to be undertaken leading to a contract to be agreed and signed by the principal parties involved. The first requirement is for a submission which must detail the following a) the need for the replica, b) the evidence that exists to allow an accurate replica to be made and c) the techniques and materials to be employed in the making of the replica. In particular, any lack of original evidence in any respect must be described, as must the intended approach to fill the gap in knowledge. It is obvious that the need for a replica exists if the only example of a work has already, or is about to self-destruct. That moment may be too late. Not all of Gabo’s works in clear plastic are in immediate danger. Later Perspex is still proving more stable than earlier plastics, though it too must be monitored. The certainty is that in time the works made in early plastics will degenerate. The need for accurate documentation of all the works at risk is therefore clear. When works become too fragile, or degeneration has started, a replica can be considered possible to replace that work in the particular museum’s collection. The replica could travel and the original remain in controlled conditions. However, Gabo should not be represented in a museum collection solely by a single replica although exceptions may be agreed to this, nor is there an intent that replicas be made to populate collections that have no original work. 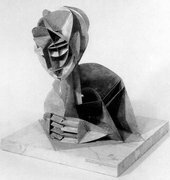 A replica will probably only be sanctioned as a replacement for a destroyed work if it is to replace that work in a museum collection that has other original work by Gabo. Accidental damage or intentional vandalism might destroy a work and a replica might be considered an appropriate replacement if all other conditions are met. The manner of destruction would only be a consideration if it threw doubt on the suitability of the collection to hold a Gabo. The absence of a work in a collection, however desirable that it be included, will not be considered sufficient cause for a replica to be made. The Tate Archive holds all the surviving patterns and templates made by Gabo which give absolute evidence of shape, but not of thickness of material, of many works. The Archive also holds the artist’s archive of photographs. Other evidence can be found in drawings and correspondence and other texts. Condition reports held by many museums and by Nina and Graham Williams may have measurements and photographic evidence. In more recent years conservators, notably but not exclusively at Tate, have recorded condition in a number of ways. The remains of a work also give some evidence. It will be necessary to establish that sufficient evidence exists to allow an accurate replica to be made of the original, in every detail. That evidence may exist for the original state of the work, or for a later time by when some ageing has occurred. Using a combination of the remains of a work and other archival material, it should be possible accurately to establish the materials of the original. Some of those materials may no longer be available; some may be considered undesirable in the replica. More modern and stable materials may now exist. In changing a material it should be that science and not eyes could detect the difference. If it can be established that originally a plastic would have been toned, then that tone should be copied; if the material was clear, that too should be copied. The original state and materials of the work may not be known for certain; the only reliable documentation of a work may date from some time after its creation, by which time some materials will have aged or have been replaced. This will give rise to aesthetic considerations for which no hard and fast rules can be established, but guiding principles can. Gabo encountered problems with materials from time to time and adjusted his methods and repaired works. The corrective techniques that Gabo used might be considered suitable when making a replica. However, corrections might be considered interference with the work: for instance, a number of works have been stabilised on wooden or Perspex bases and these bases may not have been made by Gabo. Although they are now integral parts of these particular works, they should not be copied. Gabo subsequently thickened the Perspex elements of later versions of Linear Construction in Space No.1 to give strength and this approach might be considered. The Catalogue Raisonné does not give the thicknesses of the Perspex elements. New materials may replace old ones but in choosing other materials the appearance of the original material when new must be considered. Parts should not glisten where they never did in the original. The copyright holders are not in favour of imposing artificial aging onto materials; to distress something that is pristine is to add woodworm holes with a shotgun or repair a painting with dirty varnish or worse with dirty coloured paint. The artificial aging will not itself age as would the original and in a short time will have little validity. The artificial aging pigment will itself age, but not as would the original material. When conceived, was the aging of the materials likely to be something accepted by the artist? In Gabo’s case there are some fairly safe assumptions that can be made. The plastics were considered to behave like glass; like glass they would remain in their original state. We all know that glass is a fluid and the thickness of the bottom of an ancient vertical window is microscopically greater than the top, yet in principle the glass retains its original condition. Likewise, we know that bronze and brass tarnish but stainless steel does not. That some discolouration of some stainless steel can and does occur does not mean that such discolouration should be copied but perhaps that the steel should be cleaned. If Gabo lacquered the brass or bronze he intended the cleaned metal to be the state in which it was seen. Even if the only state of a work that can be established reliably is later than its creation, the copyright holders are not in favour of artificial aging for the replica that is intended to be displayed in place of the work. There may be another form of replica, however – a study model. The materials must be completely different from those of the original, used for their ability to record form not the aesthetic of the piece. In practice, this would mean not using transparent materials where they were used in the original or any form of metal sheet if the original was made of metal. The purpose of such models must be only to record form; any attempt to imitate the aesthetic qualities of the piece would take such a model out of the range of study models into the realm of replicas. The study model must have lettered on it ‘STUDY MODEL’ in a size that is very obvious to anyone looking at the model, in bold coloured letters. The date, purpose and authorship of the model must also be lettered onto the model itself. At some time such models might be exhibited to show the history of the conservation of a work. In such circumstances it must be abundantly clear to any viewer that this is not the work but something made after it for study purposes only. Study models must also have the consent of the copyright holders. In making a replica subjective judgement, personal taste and individual skill are involved. Gabo used a limited repertoire of tools and equipment and developed certain skills. What he made might have the spirit of the machine age but they were made by hand; each has the tiny imperfections that are the inevitable outcome of his way of working, and of his judgement in accepting or rejecting subtle aspects of fabrication. One pair of skilled hands might leave different marks to another. It is not necessary to copy minute defects, like the drip of acetone that etched a Perspex plane, unintentionally. It is necessary that the edge of a plastic plane is not polished if Gabo did not polish it, to sand it if he did or leave the saw marks if he did. These marks should not be added to a greater extent than Gabo himself allowed them; some will come from the process of fabrication. Modern technology linking computers to a variety of cutting machines allows curves to be smoothed and made to conform to some mathematical progression. Such technology was not used by Gabo and if it is employed for a replica must be used without any editing of the shape. It could be used to copy a form exactly, and attention should be paid to the cut edge of the plane which may need to be altered after it is cut. Nina Williams quotes the fact that the notches made to hold the nylon monofilament are not perfectly even. They could be with modern technology; they will not be with a pair of skilled hands and simple equipment. Some of the slight inconsistencies will best be copied by using similar fabrication methods. There have been replicas made of many artists’ works and a common fault is to attempt to perfect that which the artist did not perfect. Such absolute perfection brings sterility to the replica and so misses the intent. Too perfect is sterile, too imperfect would be a travesty. It is essential that anyone who undertakes or takes part in the making of a replica of a Gabo construction examines minutely other works by Gabo, to acquire a feel for his work. Adhesives have changed since Gabo’s time and there should be no attempt to copy his adhesives. The most suitable adhesives available should be used, and be documented. In fact, full documentation of the making of the replica will be a condition of granting final approval. Study models need not be duplicated but photographed and a copy of the documentation given to the copyright holders. The copyright holders will maintain a catalogue of all replicas that have been made, anywhere. The documentation must detail all aspects of materials and techniques, the evidence used in replicating the sculpture – which might be different from the first submission, the identity of those who carried out the project and any other material that might help conservators elsewhere or in the future approach a similar project. All replicas will have ‘REPLICA’ engraved, etched or introduced into the fabric of the replica in such a way that it cannot be removed. The size should be such that the word can be read with the naked eye when the replica is exhibited. In addition, the identifying number from the copyright holders’ catalogue of replicas must be engraved, etched or introduced into the fabric of the replica but in a much smaller size. Further information may be included and will be open to discussion with the commissioner of the replica who will afterwards own it. This may identify the owner, give an accession number, the year of making or the title and Catalogue Raisonné number of the original it copies. There followed an outline of the essential elements to be included in a contract. The copyright holders, in conjunction with their copyright lawyer, also prepared a draft contract. Both are excised here as the contract is still being considered. 1. The text, written before the workshop on replication, has not been changed subsequently, except insofar as to conform to the house style of Tate Papers. This paper was written as a short discussion document for the Inherent Vice: The Replica and its Implications in Modern Sculpture Workshop, held at Tate Modern, 18–19 October 2007, and supported by The Andrew W. Mellon Foundation. Other papers produced for this workshop can be found in issue 8 of Tate Papers. Nina Williams and Graham Williams, ‘Replicas of Constructions by Naum Gabo: A Statement by the Copyright Holders’, in Tate Papers, no.8, Autumn 2007, https://www.tate.org.uk/research/publications/tate-papers/08/replicas-of-constructions-by-naum-gabo-a-statement-by-the-copyright-holders, accessed 26 April 2019.